Few things feel better than flying with only carry-on luggage. It's easier and faster to board the plane when you don't need to check in luggage - and you also get out of the airport much faster when you don't have to wait for your luggage (or worry about it, if it has disappeared). Luckily there are lots of models to choose from. It pays to spend some time comparing all these models, so you can make sure you choose a bag that is of great quality and that match your needs in relation to size and features. Having checked thousands of carry-on luggage reviews, we can say that the American Tourister Marvel is the best choice for most people. The American Tourister Marvel got a rating of 4.51 out of 5, while the average rating in the list below is just 3.72. This is the best reviewed carry-on luggage. We have checked 28,079 carry-on luggage reviews, so we can show you the weighted average rating of all the bags. If the American Tourister Marvel isn't your style, you might also consider the Eagle Creek Load Warrior. The Load Warrior is a close runner-up with a rating of 4.34 out of 5, but it's often more expensive than the Marvel. The second-best reviewed carry-on luggage. Finally, you might consider the Ricardo Beverly Hills Malibu Bay. The Malibu Bay is the third-best rated carry-on luggage with a rating of 3.98. The third-best reviewed carry-on luggage. Below is the list of all top 16 best carry-on luggage. Great if none of the three bags above are your style. PS: We have checked 28,079 reviews to make this top 16 list! There are certain items that you simply can entrust to checked luggage. If you want to keep important things close to you (or are just going on a short trip) then carry on luggage is the way to go. The thing with this type of bag, though, is that there are lots of rules and restrictions surrounding it. All of this can make it quite confusing when it comes time to choose one. You will see most people walking around with a carry on backpack strapped to their shoulder. The main draw of this type of luggage is that it is comfortable to carry, has numerous compartments, and isn’t as rigid as some of the other styles of hand luggage. Not to mention, most people now travel with their laptops and laptop backpacks are one of the easiest ways to pack your digital devices. Carry on duffel bags are also rather common among flyers. These are sturdy bags that are able to contain a larger quantity of items. This makes them ideal for people headed out on short trips and who want to carry all of their baggage as hand luggage. Duffel bags have a versatile design which fits in with a number of environments. The great thing about taking a carry on suitcase with you is that you get to neatly organize all of your belongings. They are also good for protecting any delicate items as they tend to be a little bit more structured than other types of bags. Suitcases are available either as soft shell cases or hard shell cases. A carry on briefcase is just what you need for business travel. These bags look professional and have just enough space for a laptop, other digital devices, and documents. There is also plenty of organization features as well. All carry on backpacks, duffel bags, briefcases, and suitcases can either be without wheels or have wheels. So, this is something that you will have to factor in when making your decision. Now, the upside of having a wheeled bag is that it is easier to take around with you. This way, you will not have to feel the strain of the weight that you have packed. Of course, the wheel system and the wheels themselves add both weight as well as bulk to the bag in question. This can prove to be a bit of a problem as these are factors that you need to minimize with carry on luggage. In the end, the decision will need to suit your preferred way to travel. If you do decide to go with wheels, then you will need to pick between bags with two wheels and those with four. The bags with two wheels are great for practically all kinds of flooring, including pavement and uneven ground. They are also durable and the wheels are recessed in the bag so that they don’t take up too much space. Four wheeled bags are also known as spinners. The great thing about four wheels is that you can simply push them along without making much of an effort. They also work well when traveling through small spaces. 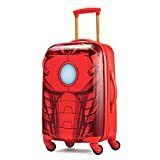 The only issue is that the wheels are fixed to the outside of the suitcase making them vulnerable. The wheels also take up additional space. When it comes to carry on luggage, there aren’t really pieces specifically for men or for women. There may be colors and designs that are targeted towards certain genders but that really, is where the differences lie. With backpacks, however, you may come across women specific packs. These are made for the smaller frames of women and can be useful for those who are a bit petite. There is no denying that getting the size right with your carry on luggage is of the utmost importance. If it is too large, then it will not be allowed onboard with you. The tricky part is actually figuring out what size that you should get. One thing you should not do is believe stores or sites that claim to have ‘official carry on sizes’. This is because there is no official size. Each airline determines what size your hand luggage should be and you will need to adhere to these rules. So, while some airlines will insist that you only bring small carry on bags with you, others may have more relaxed rules. In most cases, domestic airlines and flights will allow a carry on bag that is no longer than 22 inches. The bag should also have a width less than 14 inches and the depth should not be greater than 9 inches. It is important to remember that these dimensions are including the handles, wheels, and any other external features of your bag as well. There aren’t fixed size rules for international travel either and these, too, are dependent on the airline that you are traveling on. The dimensions are quite similar to the domestic measurements and only differ by a couple of inches. Some airlines quote linear inches rather than individual dimensions. Linear inches refers to the total calculation of the length, width, and depth of the bag. In the end, it is best to simply check with the airline that you will be using. They will be the only ones equipped to answer this question accurately. It is actually a good idea to do so every time that you book a flight. Lots of airlines change their size requirements quite regularly. While carry on luggage can seem like an all-encompassing term, you should stop and think about where is that you want to store your bag. The two main options are in the overhead compartment or under the seat in front of you. Now, if you want to keep your bag beneath the seat, then there are entirely different dimensions to think about. Here too, the size is dependent on the airline. This, of course, is because the bag must be slightly smaller than the space that is available under the seat. Since seat measurements differ with each airline, you will need to do your homework ahead of time. Usually, though, if the bag is less than 42 linear inches, it should fit well under here. Once you have dealt with the size of the bag, the next thing that you will have to figure out is the weight. Carry on luggage has weight restrictions as well. Once again, it all depends on which airline that you are flying on. Typically, though the allowed weight ranges from about 10 to 18 pounds. The reason that you need to think about this is because most carry on bags weigh upwards of a pound. The bigger and more durable the bag, the heavier it will be. So, if you want to maximize on how much you can take with you in your bag, you will need to keep an eye on the weight of the empty bag as well. The material of your carry on luggage can be important for two purposes – weight and durability. With backpacks, duffel bags, and soft shell suitcases, your biggest choice will be between polyester and nylon. If you want to keep the weight as low as possible, then polyester will probably be a better option as it tends to be lighter. 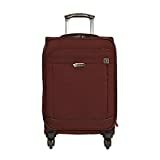 It is also good for anyone looking for cheap carry on luggage as these bags tend to cost less. For durability, though nylon is the clear winner. If you want a bag that will not tear or wear away easily, then you may want to opt for a model that uses either ripstop nylon or ballistic nylon. These are abrasion resistant and can be used for a long time without showing signs of damage. If you are looking for hard shell suitcases then some form of plastic is typically commonly available. PVC plastic quite light but also gets dented relatively easily so it isn’t a great idea if you do a lot of heavy duty traveling. The ABS plastic is a great deal stronger but predictably weighs more as well. You may also find hard shell suitcases that are made from aluminum. While they are the strongest of all the options, they also weigh the most. If you want a bag that is more for form rather than function, canvas and leather are other options you can turn to. Of course, you will need to be aware that these don’t stand up well to heavy use and may begin to look worn out after a few trips. With proper maintenance, though, they could last for some years. This is the extent of what you need to know about selecting carry on luggage for your next trip. Classic carry-on luggage and models that haven't yet got enough reviews to be ranked. List ID 41. Images from Amazon Product Advertising API and shop datafeeds.